White powder around my nose. White powder on my lips and chin. I wipe it away, knowing in a few more minutes, sweat will drip and salt will begin crystallising again. It's hot. I feel dizzy. The white salt dries and cracks my lips. No pleasure here, riding in this heat. I'm running out of water. Again. The high mountain road from Popayán to Pasto has a bad reputation for many reasons. Talk of narrow roads with fast traffic. Few restaurants or water and long lonely sections with nothing except your own company. But I never expected this heat so high up. Max and Devora have taken the bus ahead to Pasto. After the attack and robbery we were all shaken up and Max's injured leg meant he could not ride. It was not the best start. And this didn't settle with me for some reason. We had been generously hosted for one night by Ronald and his family. Ronald, also a cycle tourer, was actually not home, but he kindly called his parents and organised for us to stay. He was due back later the next morning and as a courtesy we waited till he arrived to say thanks. Naturally, a long pleasant conversation and breakfast followed. Grateful for the food and hospitality as ever, I still felt we were setting off way too late to make any meaningful distance today. I have now resigned to travelling short days with Max and Dev. I do find it a little frustrating sometimes, doing such short days but I enjoy their company so it makes up for it in other ways. The destination today was Rosas. A mere 45km's away. By the time we reached Timbio, we were definitely hungry. With only a small fruit salad for breakfast and a steep hill to exit the city we didn't see any place to stop till Timbio. Max, as ever racing ahead, had met up with another cyclist. An enthusiastic local cyclist who he asked where we could get a good breakfast. "Follow me" he called out. Tired and hungry we followed him to the restaurant, which turned out to be someone's house.
" I just want to introduce you to my friends first..."
I thought we were being invited to eat here at first, but it quickly became a small social event and spectacle to show off the travelling cyclists. Sitting on the roadside in the hot sun we were all getting a little irritated and more hungry. We were offered drink then presented to the entire family followed by a round of photographs. Honestly, I was not in the mood, but eventually, Daimler whose home it was and his friend 'el Pequeño' our guide escorted us to a local restaurant. Feeling a little better after food, I wanted to keep moving as it was now almost noon. More photos and conversation later we were escorted to the edge of the town and sent on our way. Max suddenly sprinted 50-60 metres ahead. Full of energy and riding a little crazy as he occasionally does. Devora was pedalling at a steady pace up a gentle hill and I followed a few metres behind her. Passing a small motel south of the town, the hill became steeper and we could see Max approaching two lads on the roadside. My view was blocked by Dev for a moment. Suddenly she screamed out and I saw Max swerve sharply across the road! Fortunately there was no traffic. The lads were chasing Max and I saw him swing a punch at one, then his bike fall and Max ran away limping..
Devora was now screaming "Call the Police!! We are being attacked"
I tried to sprint ahead to help but Max was too far ahead by now, and I had thoughts rushing through my head that I would be too late and could not do anything anyway. I saw one lad started cutting at Max handlebar bag and picking at the contents. Dev and I were still shouting. "Get away!! Leave him alone!!" A Motorcyclist, seeing the fighting, stopped a moment later. Dev shouted at them and they turned and accelerated towards the thieving bastards, who saw the cavalry coming and jumped a fence to get away. I had arrived at this point completely out of breath and ran over to see what I could do, if anything. By now, the farmer who owned the land appeared wondering what the commotion was and one motorcyclist had jumped back on his bike to try to cut off the thieves further down the road. Dev had been blocking traffic trying to get extra help from a bus and a truck with no success. Max was pale and out of breath! "He's got a gun!" He said, pointing in the thieves direction. "The other has a large knife"
Both had disappeared now, but with talk of a gun I felt my insides cramping up! The motorbikers and the farmers had reappeared and Dev was terrified and tearful as Max hopped around with blood dripping from his right leg. I decided to go for help. I told Max and Dev I would go back to the house in Timbio and see if that family would help. I knew they would. At least I could try to contact the Police directly? Sprinting as fast as my overloaded recumbent would carry me, I arrived back at the house a few minutes later and completely out of breath I managed to spit out the word "Robos!" then "Ladrones! I didn't know which word was correct, and the guys looked at me somewhat confused having only said goodbye some 15 minutes before, I now returned panicked and out of breath. After a moment, it sank in and Daimler called the police and then we jumped on his motorbike to quickly return to the scene. We arrived to find the farmer had already loaded Max bike into his van, Dev in tears and shaking still with the motorbikers about to leave as the thieving scum had disappeared somewhere across the farmers land. They only took 1 inner tube finally! We made our way back to the house and the whole family came out again to help unload the bike and passenger. Max had seen the guys ahead glancing back several times then messing with the contents of their rucksack. Taking something out, but it was not clear what. He was instantly a little wary of their strange behaviour. As Max passed, one guy lifted his shirt to reveal the pistol he had taken from the bag! Max realised what was happening and swerved across the road trying to make a fast U-turn to get away. 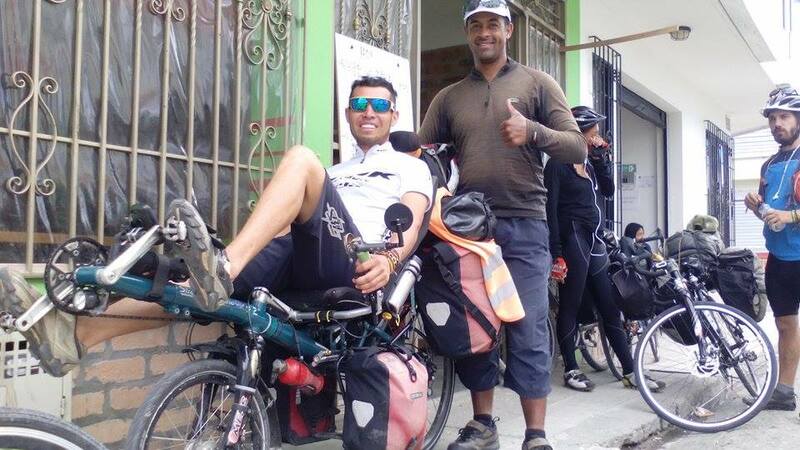 The Thugs had probably seen him in the town and thought it was a good opportunity to rob a lone 'Gringo' cycling through the region. Not realising we were a group of three. Daimler and his family took us in immediately and began to clean up Max leg wound. As his bike had fallen, the chain ring teeth has punctured his leg and severely bruised his Achilles tendon. Blood streamed from the oily cuts as the family provided water to clean the wound. Max lay on the floor with a severely cramped leg muscle. A family friend tried to massage his calf muscle but it was very cramped and very painful. Despite Max's protestations, the man kept massaging and Max called out in agony. Eventually the man stopped a but this probably made the damage to his leg worse. The shock of the terrible day over, the family made us comfortable, and invited us to stay. They were incredibly generous and helpful and I felt guilty about being a little dismissive before. This counts as another little miracle on my road of many. The willingness and generosity of strangers in a time of need. I think we are all grateful for all the help of the family and towns people who rallied round to offer support and assistance. Thank you to the Muñoz family! They were all shocked to hear of the attack. Continually assuring us that such events are virtually unheard of in the area. "They can't be locals, they will get lynched if they are?! The Police had still not responded despite at least four phone calls from various people. We were told four officers had been shot and killed recently, by thugs further down the same road we were travelling along. This is a dangerous and unstable region. Nerves flared again in me! Devora cleaned the wound and it was clear Max would have a scar. Well 4 actually. Each 1/2 inch apart. He insisted he would be fine the following day. But having injured tendons myself I suspected he would be off the bike for quite a while. What a disgrace! Shame on you! We settled into our space in the house. Dev did not want to ride the next section. Max naturally could not, so they chose to take the bus back to Popayán then a second one directly to Pasto. After weighing up the options, risks and alternatives I decided to ride. More fearful of running out of water than hooligans on the road, two days later we all set off in our respective directions. I always said if I got into trouble I would make a U-turn too and despite what had happened I still feel that most people I will meet will be good. It is unfortunate what happened to Max. It could have just as easily been me or Devora and it could easily have also been much worse. As I travelled alone through the unexpected desert, I had these thoughts racing through my head and I kept glancing at my bear spray with it's trigger safety off. Every motorbike that passed became a potential threat, Every car that slowed to stare was about to push me off the road and rob me. But like the 26,000 kilometres before me, the people were just curious. All they pushed, was a camera in my face. I soon relaxed a little more and on the second day I put the safety back on. Slowly climbing up to Pasto, I stopped one night in El Bordo. Then the second night in El Tablon. Both with very isolated sections of road in between, few resources, water and extreme heat. I passed through several military and Police checkpoints along the way. The sun almost directly above all day as I am virtually on the Equator now. My focus changed from where the next thief would jump out, back to where the next water stop would be. 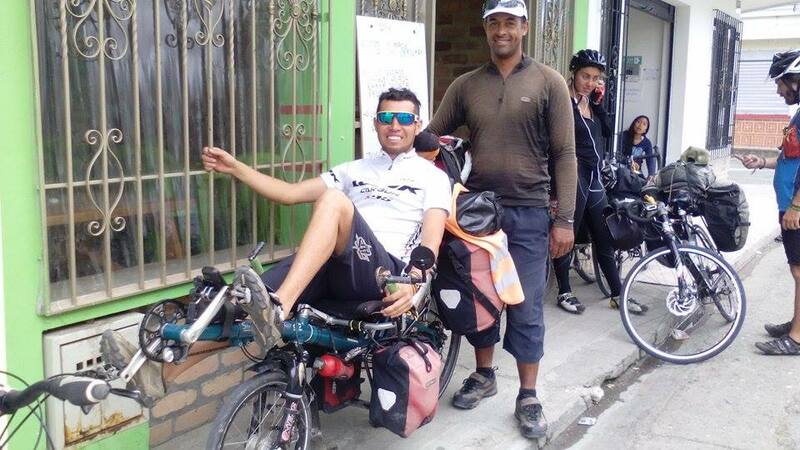 From El Tablon to Pasto was 68km of pure ascent. It started with a cold morning to 30c+ heat from 9 am till 3 pm and I ran out of water, twice. Then cold again in the evening as the sun was hidden behind the 4276m Galeras Volcano above Pasto. The heat and height and almost 12 hours on my bike left me exhausted. I have spent longer here than usual in Pasto, in a cheapish hotel. Expensive by Colombia standards but very comfortable. Max's leg is slowly improving but after a visit to the hospital, he was told to take 2 weeks off the bike. Physically and financially this is tough on him and fortunately he has Devora to help him. They are currently resting in the home of Warmshowers host in Pasto. Undecided about when they will continue. Now, I am in the Andes.